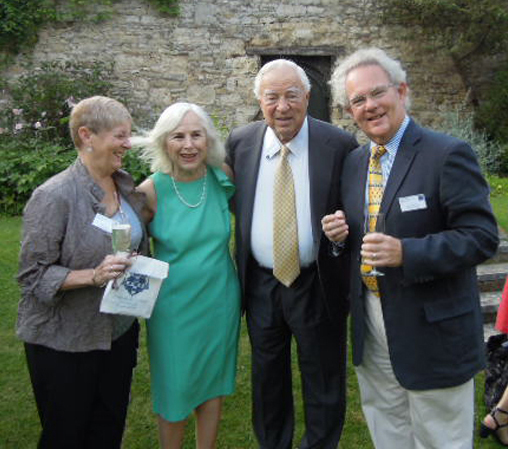 Approximately 20 years ago, Pat read an article by travel writer and publisher Arthur Frommer, praising a week he had just spent at Oxford. Two years ago, she saw another post by Arthur saying if you wanted to sign up for Oxford Experience 2010, now was the time to do it. We did, and had a wonderful experience. See our 2010 posts at …. This year, we signed up again. At the opening reception, I was speaking to a man and looked at his name card. “Are you THE Arthur Frommer,” I asked, and thus began a wonderful week long friendship with Arthur and his lovely wife Roberta. It is indeed a small world, full of coincidences. NOTE: Apparently the feeling was mutual. Here is a quote from Arthur’s blog (http://www.frommers.com/blog/) … My wife and I met people from Australia, Paris, Nashville, the Cotswolds, California, and even Key West (an especially engaging couple). Each was a vital individual in love with learning. This year, Pat took a course about “Cardinal Wolsey” offered by tutor Glenn Richardson. Wolsey is best known for failing to convince the Pope to allow Henry VIII to divorce from Catherine of Aragon. Lew’s course was titled “The Brain and the Senses,” taught by Gillie McNeil. Each course was taught from Monday to Friday, 9:15 to 12:45, with a break for tea and biscuits, and each was a delightful and challenging but not too stressful learning experience … lots of learning; interesting classmates; no examinations; no papers! Whereas Lew was terrified to learn that each time he sneezes, which he does fairly often, he blows away brain cells that have lodged just above the nasal passage. Cardinal Wolsey was also the original builder of Christ Church College,Oxford University, the site of the Oxford Experience. It is a magnificent campus, with the “Harry Potter” dining hall, a beautiful cathedral, and enchanting parks and ancient buildings. It is a privilege just to be there for a week, and to eat all our meals in a dining hall where Queen Elizabeth I, Queen Elizabeth II, and many British Prime Ministers also dined. As one of our classmates said as he reclined in a nearby pub with a pint of beer, “Seven hundred years ago, another man was sitting right here, also drinking a pint. The city of Oxford is also a wondrous place, with the other Oxford campuses, soaring churches, many delightful pubs, and the incomparable Blackwell’s bookstore. This entry was posted on August 1, 2012 at 5:00 am	and is filed under ... 2012, ... UK - Oxford. Tagged: Oxford, Oxford experience. You can follow any responses to this entry through the RSS 2.0 feed. You can skip to the end and leave a response. Pinging is currently not allowed. I had an absolutely brilliant two-week stay at the OE 2012 and absolutely mean to be back in 2013, my 9th time at this particular programme. I attended Glenn’s “Henry VIII” course last year,of course Henry and Cardinal Wolsey are very closely related, but even so Glenn managed to “tell the (hi)story” from the Cardinal’s point of view rather than the King’s … AWESOME – if you ask me! So good to hear from you. We do not think we will be at OE 2013, but OE 2014 is a definite possibility. Lew and Pat, it appears that my “Bucket List” has just gotten longer. Sounds fabulous. I would love to hear more about it.